1) Rafale will not be entering dogfight with its full external load. Fuel tanks will be dropped, and all but wingtip missiles expended, prior to the merge. Empty hardpoints and wingtip missiles cause relatively minor drag penalty, one that cannot negate F-35s far higher baseline drag. Airframe itself is common between Rafale C and Rafale M, and is designed for 16,5 g ultimate limit load. As 16,5 / 1,5 = 11, Rafale can pull 11 g maneuvers on a regular basis without shortening airframe life; this can be seen here (Rafale in video pulls 10,1 g). While airframe itself is common, other modifications – such as stronger landing gear and larger and stronger tail hook – added 500 kilograms to Rafale M when compared to Rafale C. Still, there is 95% parts commonality between Rafale C and Rafale M. Like Gripen and Typhoon, Rafale can, in certain parts of flight envelope, maintain 9 g as long as pilot can withstand it. Rafale can in fact pull 9 g at 500 kts and 10.000 ft and still accelerate when clean (and clean configuration includes 2 wingtip AAMs), with service ceilling of 50.000 ft (15.000 meters) at least, possibly 59.000 ft (18.000 meters). Dassault Rafale is monoplane delta wing aircraft with close-coupled canard. Wings are of mid-wing arrangement with large degree of wing-body blending, resulting in aerodynamically streamlined aircraft with less interference drag than either high- or low- -wing configuration. 48 degree wing sweep results in a transonic bias aircraft with supersonic capability. This lower wing sweep also results in formation of the primary vortex closer to wing surface than in highly-swept (60 degrees or more) delta wings. 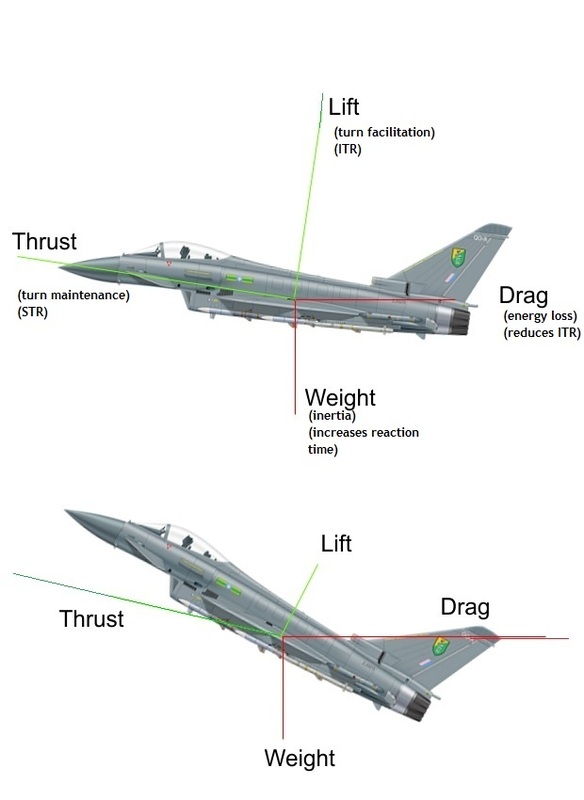 Additionally, this relatively low sweep compared to some other delta-wing fighters results in lower span loading, minimizing lift-dependent drag. Wing thickness also has impact on maximum speed: thicker wing means lower maximum speed but also better characteristics in combat due to delayed flow separation. Latter shortcoming can be somewhat countered by usage of flaps. Wings can twist to prevent wing tip stalling and subsequent loss of control. Since center of gravity is aft of center of lift, trimming during flight improves maximum lift by maybe 20%. Wings have launch rail mounted at end, and there is single vertical stabilizer. As unswept wings are limited to subsonic flight, and wings with sweep greater than 60 degrees have poor airfield performance, high lift-induced drag, and poor maneuverability, wing sweep in modern combat aircraft is always between 20 and 60 degrees, something that Rafale’s wing sweep achieves. Delta wing leading edge creates vortices which help lift at higher angles of attack. Whereas lowly-swept wings as found in civillian aviation stall at AoA values between 14 and 18 degrees, more swept wings offer advantage of strong vortex lift, which can be further improved by high-lift devices such as LERX which strengthen wing vortices. Vortical flows form close to wing’s surface and starts forming at very low angles of attack. End result is large improvement in lift/drag ratio at subsonic speeds for wide AoA range as well as improvement in maximum AoA values. There is, however, large amount of lift-induced drag at subsonic speeds. Another benefit of delta wing is its low wing loading (approximate measure of lift-to-weight ratio) which results in good turn performance; as low wing loading results in high gust sensitivity and is thus undesireable for strike aircraft, Rafale’s very low wing loading makes it obvious that it is optimized for air superiority. High lift coefficient (of which wing loading is part) also improves airfield and cruise performance, but negatively impacts low-altitude penetration. Additionally, delta wing had good dynamic stall characteristics. As airfoil is rapidly pitched upward, it creates significant vorticity in air flow, improving both lift and pitching moment. Result is an improvement in instantaneous turn rate. Past the Cl(max) AoA, lift loss is more gradual. Usage of tailless delta means that there is no adverse tailplane/afterbody pressure drag interference, and aircraft does not exhibit Dutch roll when travelling at high speed. However, as there is no tail to provide roll control, and control surfaces are on the wing itself, it means that wing must be stiffer, limiting wing twist and increasing possibility of wing tip stall. Launcher rail located on wing tip improves L/D ratio. Flutter and aerilon reversal are also eliminated, and due to Rafale being unstable, elevons add to lift when turning. Wings themselves are anhedral, reducing lateral stability; this was required due to Rafale’s wide body and wing vertical position. Flaps and aerilons can be used to improve lift during takeoff and landing. Canards are, as mentioned, of close-coupled configuration. This has benefits on aircraft performance in both subsonic and supersonic flight when compared to conventional delta wing or wing/tail configuration. One of reasons is that canard produces vortices which are very strong immediately behind canard itself, and get progressively weaker, but also a downwash. Properly positioned downwash creates a low pressure region on front part of the wing upper surface which has a significant contribution to lift, and also causes aircraft to be dynamically unstable, providing advantage in response to control surface inputs when compared to either stable or statically unstable configurations. Further, vortices created by canard root, aside from improving wing lift during maneuvers by themselves, interact with vortices created by LERX (LERX itself creates vortices from both root and wing junction, helping both body and wing lift; vortices from canard tip energize outer parts of wings and do not interact with any other set of vortices but help with avoiding wing tip stall and improve response to aeliron inputs); this interaction between LERX and canard root vortices results in vortices being strengthened, prividing large increase in Clmax and decrease in angle of attack for Clmax, by lowering effective angle of attack of the wing. This in turn could have resulted in less lift at very low angles of attack, but vertical separation between canard and wing ensures that it does not become an issue (also a reason for Gripen’s angled canards). It does stabilize detached vortex of the main wing, thus providing greater vortex lift and which results in increase in lift at higher angles of attack; vortex lift also starts sooner for close-coupled canard configuration than for pure delta (and since canard does not interact with the wing, long-arm canard configuration can be considered “pure” delta for purposes of this explanation). Result is that Rafale does not need to achieve as high angle of attack for Clmax as pure delta would have, thus reducing induced drag from which delta-wing aircraft suffer at high angles of attack; it also achieves more lift at Clmax, by up to 50%. Wing center of pressure also moves aft with increasing Mach number due to canard delaying stall over outboard wing panels, and there is reduction in subsonic-supersonic aerodynamic center shift which means that aircraft remains unstable even when supersonic, thus improving maneuvering performance. All of these effects are stronger for canard positioned above the wing than one positioned at same level as wing; movable canard is also better lift-enhancing device than fixed canard or LERX. LERX vortices, aside from helping wing lift, also increase body lift when maneuvering, made possible by large degree of wing-body blending present. Another benefit is reduction in wing bending moment and structural weight due to shift of aerodynamic load distribution inboard. Close-coupled canards allow Rafale to maneuver in post-stall regime by increasing maximum lift coefficient (Clmax), making it supermaneuverable (post-stall regime is any angle of attack beyond Clmax; TVC is not required for post-stall maneuvers, as even aircraft such as F-18 can achieve angles of attack beyond Clmax. Maximum angle of attack that Rafale has reached during testing is 100 degrees, showing extensive post stall maneuvering capabilities). This is a result of canard-wing vortex interaction, with presence of canard eliminating wing vortex breakdown. PSM can allow Rafale to trade energy for positional advantage in one-on-one aerial combat (this is not as good idea in flight-on-flight or squadron-on-squadron, let alone larger, encounters). They also allow spin recovery and superstall recovery; that is, aircraft with close coupled canards are almost impossible to depart from controlled flight (FCS and machanical problems notwithstanding). Additional advantage of close-coupled canards is that canard root vortexes energize air flow around vertical tail fin, meaning that it remains effective even at high angles of attack (same effect which allows wing control surfaces to remain effective at extreme angles of attack). Reason for this is a constructive interference between vortexes created by canard and those created by LERX, with downwash from canard suppressing flow separation from the wing and canard trailling edge vortex creating low pressure region above main wing surface; this effect is very pronounced in Rafale due to high canard configuration, and region makes a major contribution to lift; in fact, due to vertical separation of canard from wing, vortex lift starts appearing from 4,27 degrees of AoA. Using same effect, Saab Viggen was able to generate 65% greater Clmax at approach than a pure delta wing, achieve much greater trim control than pure tailless delta (such as Mirage) and achieve STOL capability. Rafale has advantage over Viggen in that its canards are controllable, allowing for better control of vortices, and can take off in 700 meters when carrying 4 MICAs and auxilliary fuel tank; minimum takeoff distance is 400 meters and landing distance is 450 meters. When landing, both canards and trailling-edge control surfaces can be used for braking, and Rafale may be able to use canards for braking even while in flight. Large degree of wing-body blending means that vortices, especially those originating from canard root, allow for large amount of body lift during maneuvers. It also reduces drag in level flight, improving range. Vortexes also make wing more responsive to control surface inputs, including roll. Along with canards and LERX, Rafale can improve lift at low speeds by using flaps, which help prevent flow separation at higher angles of attack. Combination of LERX, canards and flaps also produces very large drag reductions at typical maneuvering angle of attack, improving sustained turn rate. In supersonic flight, close-coupled canard-delta configuration suffers from smaller aerodynamic centre shift with Mach number than pure delta, tailed or long-arm canard configuration, leading to lower trim drag due to reduced control surface deflections, and maintaining maneuvering advantages of unstable aircraft (all other configurations result in aircraft becoming stable during supersonic flight; this means slower response to control input and less lift since control surface upward deflections in stable aircraft detract from lift). Combined with already-discussed close-coupled canard features, this results in improved wing response to control surfaces inputs. Close-coupled canard also provides natural damping, making turbulence reduction FCS function unnecessary; while this characteristic is very important in low-level and transonic flight, it helps improve flight characteristic in all flight regimes. One of important factors in airframe design is that drag rises sharply in transonic region, from mach 0,8 to mach 1,2, often doubling when compared to drag below mach 0,8. At subsonic speeds, lift dependant drag varies inversely with square of the wing span, which means that maximising wing span is desireable. But in supersonic flight, increasing wing span leads to large increase in drag. However, Rafale’s LERX creates shocks at its root, in front of wing leading edge, thus reducing drag and allowing it less sweep and larger wing span than seen in Mirage. This helps counteract drag caused by close-coupled canard. Mid-wing vertical arrangement is more laterally stable than low-wing arrangement, especially when combined with Rafale’s wide body. As too much lateral stability can cause severe Dutch roll and excessive roll response to lateral gusts, Rafale’s wings are designed with anhedral to reduce stability. Rafale uses two semi-circular air intakes on the windward side, separated by the body so as to prevent interaction in case of single engine failure. Their position, being shielded by the airframe, provides protection against both high angles of attack (to give an example, F-18s air intakes encounter air flow at around 60% of aircraft’s angle of attack; this is result of both their being shielded by LEX and fuselage to the side of intake redirecting air flow towards the intakes) and yaw angle, as well as sideslip. This design also means that fuselage takes the strain during carrier operations. Intakes are separated from the fuselage so as to avoid capturing the fuselage boundary layer (layer of air where air slows from high velocity relative to aircraft at its edge to standstill at the surface itself) as boundary layer, if enters engine, impairs pressure recovery and increases distortion, thus lowering intake performance; space between intake and fuselage is called external boundary layer bleed. This space is repartitioned, and expansion waves from it energize canard root vortex. Engine cooling duct is also located in this layer. In case that Rafale is equipped with stronger engine, intakes can be enlarged. There was no need to incorporate moveable lips: engine takes what it needs, and cannot have air forced into it. What this means is that at high air speeds some air spills around the intake as there is more air flow than engine can accept. This may help the above-mentioned effect of canard root vortex energization. As engine can only make use of subsonic air flow, air flow captured in supersonic flight must be slowed down to Mach 0,4-0,5. 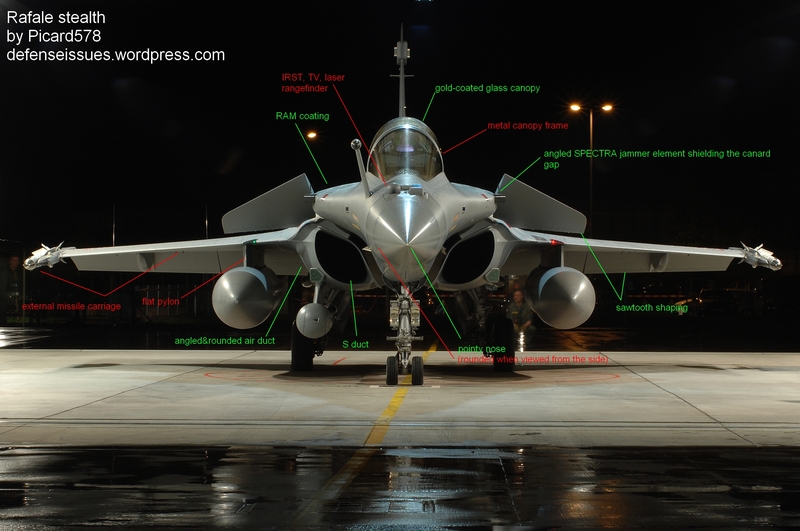 This is done through series of shocks, with first set of shocks happening at the diffuser plate, second set at air intake mouth and further shocks being generate within the intake; it is addition of diffuser plate that allows Rafale to achieve Mach 2,0. 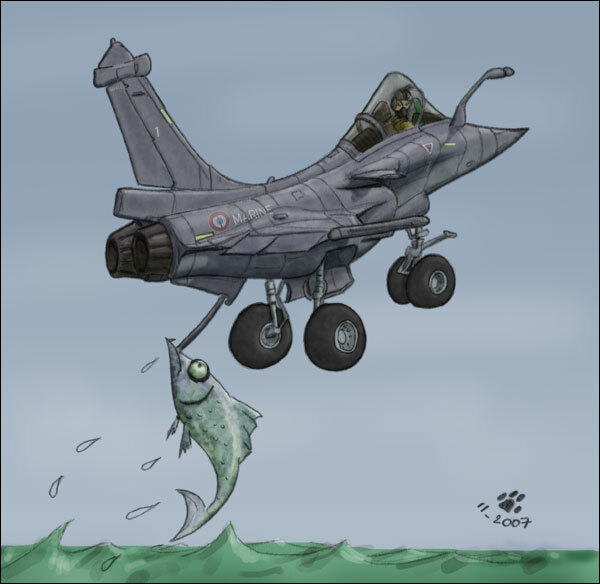 Dassault has opted to reject dedicated air brake (which was present on Rafale A but not on production Rafales) to save on complexity and weight, as it was deemed unnecessary – Rafale can use its control surfaces (canards and elevons) instead of brake. This also means that there is no 6 o’clock blind point due to using air brake. Vertical fin is very high in order to remain effective at supersonic speeds, but also due to relative aft location of center of gravity, which requires larger control surface for the same effectiveness. While it may have been rendered ineffective at high AoA in conventional designs, vortices created by LERX and canards mean that it remains an effective control surface even at relatively high angles of attack. Radome gives good aerodynamic characteristics as well as good radar performance as a result of its axisymmetric shape. Canopy is designed to provide good rearward visibility, though framing limits visibility in some directions; nose shape provides very good visibility over the nose and sides. Framing does allow for a fixed windshield in the event that canopy is detached. Rafale is powered by two Snecma M88 afterburning turbofans, which allow it to supercruise in dry power at Mach 1,4 with 6 air-to-air missiles, or Mach 1,3 with 6 air-to-air missiles and a supersonic fuel tank. When not carrying external stores, Rafale can reach Mach 2 (dash) and 16.800 meters. Compared to turbojet, turbofan produces lower proportion of its thrust without reheat, but has far lower fuel consumption. Unlike turbojet, turbofan can also achieve as much as 200% of dry thrust when in reheat, albeit at cost of massively higher fuel consumption, which is as much as 700% of consumption when dry. M88 has two cooling channels, reducing temperature of exhaust; it also has additional external nozzle, which helps hide its exhaust and limit angle from which a good lock can be established by using engine exhaust’s IR signature. Engine injects cool air around the engine casing which cools the engine (reducing IR signature of the entire rear part of the fuselage) and nozzles before shielding the exhaust with the cooler air. Engine is designed primarly for low altitude penetration and high altitude interception missions. Its smoke-free design improves fuel efficiency and makes aircraft harder to detect visually than older smoky designs. It can be reassembled and put back into operation without using the test bed, and modular design (21 modules) means that there is no need to change entire engine if it malfunctions. M88-2’s static thrust is rated at 10.971 lb dry and 16.620 lb with afterburner; this gives Rafale thrust-to-weight ratio greater than 1 at air-to-air takeoff weight. Nozzle is variable-exhaust, which allows for optimization of exhaust velocity, and therefore thrust produced. Rafale has a landing parachute fitted below tailfin. Both Rafale C and M have landing arrestor hook, but Rafale M hook is larger and stronger than Rafale C’s, as necessitated by carrier landing requirements. Rafale B uses same hook as Rafale C.
Rafale M’s landing gear is stronger than C’s, due to carrier operations requirements; nose gear is also longer, giving it a nose-up position when on the deck. This however adds weight. While Rafale is not a VLO aircraft, measures have been taken to reduce its radar cross section. Main aspect of stealth design is concentrating most radar returns in very small number of “spikes”, which leads to design that emphasizes small number of parallel surfaces. But frontally, main contributor to RCS in traditional fighter aircraft are engine faces. Thus, modern designs, including Rafale, have curved intakes that hide engine faces. Further, Rafale has sawtooth design on all surfaces that are not angled when viewed from front, such as inner air intake surface as well as wing and canard trailling edge control surfaces; all panels and landing gear doors also have sawtooth design. Rafale’s fin is radar-transparent, and air intakes are treated with RAM. It can also carry 2 missiles in wingtip carriage; drag- and RCS- -wise, these missiles are almost irrelevant. Rafale’s canopy is also coated with gold, which reduces RCS signature from rather uneven cockpit innards, while protrusions are used to hide gap between canards and the airframe. All these measures provide Rafale with frontal RCS that is, according to Dassault, 1/10 of Mirage; this translates into 0,1-0,2 m2. While non-retractable probe does cause small increase in RCS, Dassault opted for it instead of retractrable one in order to reduce mechanical complexity and increase fuel flow, thus reducing refuelling time. As for IR stealth, engine features described above, as well as Rafale’s excellent aerodynamic design, make Rafale’s IR signature comparatively low, far lower than so-called stealth fighters’ (F-22 and F-35, though F-22 may have lower IR signature from direct rear). Additional factor in reducing aircraft’s IR signature is Hot Spot treatment. Engines are smokeless, which helps reduce visual signature. However, all these stealth measures are worthless if fighter is using its radar to find the enemy. Thus Rafale has a wide array of passive sensors which allow detection, identification and targeting of airborne and surface targets; more about these later. To survive possible battle damage, Rafale has dual redundant hydraulic and electric control system. Fly-by-wire controls can be automatically reconfigured by the system in the event that battle damage is detected. Further, many of its control surfaces are also redundant – both canards and trailling-edge control surfaces can be used to control the aircraft, and both can also be used as air brakes to reduce landing distance. Rafale is also EMP resistant since it can serve in nuclear attack role. Rafale uses Martin-Baker Mark 16F “zero-zero” (zero speed, zero altitude) ejection seat, which is inclined 29 degrees to improve pilot tolerance to g forces (inclination is almost identical to F-16s 30 degrees). In fact, “Rampant Rafale” article stated that with such inclination French pilots have found no reason to carry upper-body pressure suits, albeit it gives no details on g forces pulled without it. An on-board oxygen generator system is used to eliminate the need for stockpiling oxygen canisters. Pilot uses sidestick controller mounted on the right side of the seat and throttle on the left; this arrangement makes use of stick under high g loads easier than with center-stick arrangement. Rafale also has direct voice input capabilities, allowing pilot to perform actions through spoken commands. Rafale also features a “glass cockpit” with wide-angle holographic head-up display and two color flat-panel multifunction displays with touch screen interface. There is “extraordinary” amount of sensor fusion, making it easier for the pilot to concentrate on fighting. 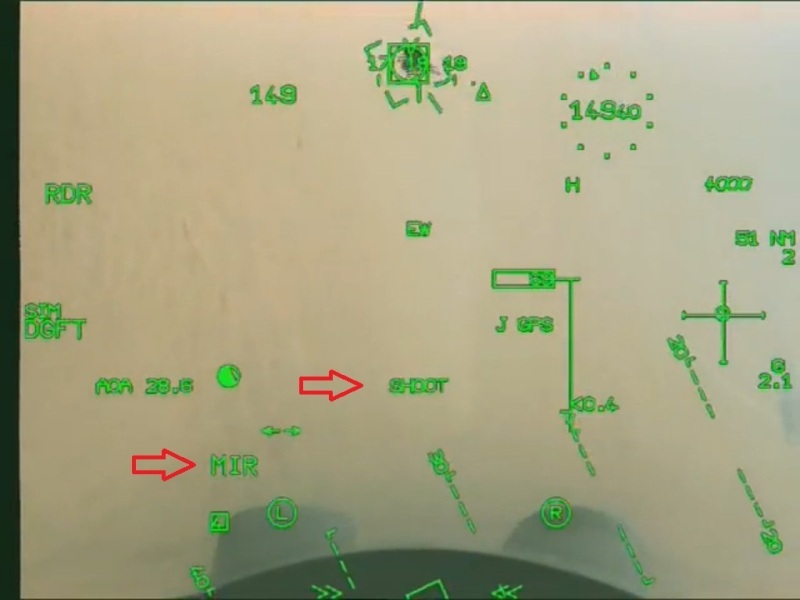 What is interesting about Rafale is that HUD and cockpit interface are in English, even in French aircraft, and pilots (sometimes at least) even speak English on briefings. This might be a leftover of Cold War when such practices would improve coordination with rest of NATO. While Rafale is very sensitive to control inputs, for purposes of refuelling there is a “RFL” DFCS switch, which reduces flight controls responsitivity and makes aircraft feel more stable and conventional. RBE2 PESA radar currently in use allows for range of 139 km against 3m2 target; AESA radar in development can detect 3m2 target at 208 km, or at 278 km when coupled with SPECTRA. RBE2 PESA can track up to 40 targets and engage eight of them at once with MICA missiles. It also supports air-to-ground attack for ground and naval targets, navigation and automatic terrain following modes, provides +- 60° azimuth and elevation coverage, and allows for IFF interrogation; it also has LPI characteristics. While it was possible for Rafale to go straight for AESA, Dassault engineers opted for developing PESA first to reduce risks. There are two optical systems that compose OSF: TV camera, and IRST. IRST is dual band, covering 3-5 and 8-12 micron wavelengths, and allows for detection of subsonic fighter aircraft at distances of up to 80 kilometers from front or 130 kilometers from the rear. This would also allow for detection of AMRAAM-class BVR missile launch at 130 kilometers, and detection of missile itself at little less than 120 kilometers. It can also act as FLIR, providing target image up to 40 kilometers away. According to report, it can show image of Transall cargo aircraft through a “fine layer of clouds” at more than 40 kilometers. TV camera can identify aircraft at 45 kilometers, whereas laser ranger coupled with these systems allows for ranging at distances up to 33 kilometers. This ID capability is important since noone will turn on IFF (or radar) in a combat zone. While TV camera itself is fixed, offering 60 degree FoV, IRST can be steered. This allows it to act like a radar, searching a volume of sky, and provide +-90 degrees FoV coverage. IRST can search for targets independently, be slaved to radar or be cued by SPECTRA. In air-to-air combat, due to frequent high-G maneuvers, with change of plane of maneuvre being common, high-deflection shots and snapshots are common, with length of burst typically not being greater than 1-1,5 seconds. As Rafale’s GIAT-30 is a revolver cannon with a 0,05 second spin-up time, it will perform better than Gattling cannons. Relatively high caliber and precise nature (revolver cannons are inherently more precise than Gattling ones) of GIAT-30 is advantage since airplanes have vulnerable areas, and shot into these areas can disable the aircraft. Under real conditions, projectiles also tend to be more effective if concentrated on a smaller area. 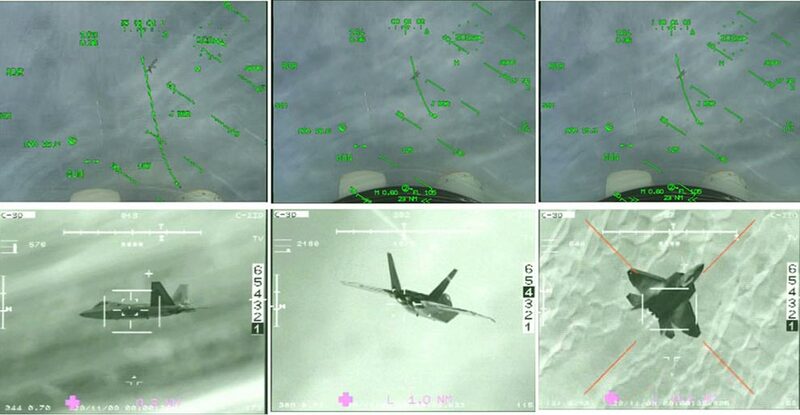 However, GIAT-30 may be too precise: targeting other fighter is difficult. Other important charactersitcs of aircraft cannon are 1) maximum rate of fire, 2) delay between pressing the trigger and first projectile leaving the barrel, 3) delay between pressing the trigger and maximum rate of fire being achieved, 4) number of projectiles fired in first 0,5, 1 and 1,5 seconds, 5) weight of projectiles fired in first 0,5, 1 and 1,5 seconds, 6) number of 0,5 and 1 second bursts avaliable, 7) energy of all projectiles carried. In next paragraph, I will compare GIAT-30 to BK-27 in Typhoon and M-61A2 in F-22 to give approximate idea of GIAT-30s strengths and shortcomings. GIAT-30 has maximum rate of fire of 2.500 rpm, delay before achieving maximum RoF of 0,05 seconds, and muzzle velocity of 1.025 meters per second, with each projectile weighting 275 g. In first 0,5 seconds, it will fire 20 rounds weighting 5,5 kg, and 41 round weighting 11,3 kg in first second of firing. Rafale carries 125 rounds, enough for 6 0,5-second bursts (more if lower rate of fire is selected). BK-27 has maximum rate of fire of 1.700 rpm, delay before achieving maximum RoF of 0,05 seconds, and muzzle velocity of 1.025 meters per second, with each projectile weighting 260 g. In first 0,5 seconds it will fire 13 rounds weighting 3,38 kg, and 27 rounds weighting 7,02 kg in first second of firing. Typhoon carries 150 rounds, enough for 11 0,5-second bursts. M-61A2 has maximum rate of fire of 6.600 rpm, delay before achieving maximum RoF of 0,25 seconds, and muzzle velocity of 1.050 meters per second, with each projectile weighting 101 g. In first 0,5 seconds it will fire 41 round weighting 4,14 kg, and 96 rounds weighting 9,7 kg in first second of firing. However, since it has trap doors covering it to preserve F-22s stealth characteristics, there will be a 0,5 second delay between pressing the trigger and first projectile being fired if pilot didn’t open gun doors beforehand. Thus F-22 will fire 41 rounds in first second of firing. As it can be seen, GIAT-30 has higher effective throw weight than either of other two principal Western fighter cannons, and also higher effective rate of fire than BK-27 and F-22s M-61 installation (due to F-22s stealth requirements). But ammunition avaliable is limited due to its high calibre and Rafale’s relatively small size. Rafale C has 14 external stores attachements, of which 12 can be used for weapons carriage; two wing stations closest to aircraft’s body are only used for air-to-ground weapons, which means that Rafale can carry 10 air to air missiles. Missiles include MICA, Meteor and Magic 2; all 10 stations can carry MICA missiles, though some can be replaced by Magic 2 and Meteor missiles, for a mix of 4 MICA, 4 Meteor and 2 Magic 2 missiles. There are two wingtip AAM stations and four conformal AAM stations at each side of the fuselage, meaning that Rafale can carry a total of 6 AAMs while suffering neglible drag (and RCS) increase. In Rafale M, longer and stronger nose gear required for carrier landings necessitated removal of front centerline stores pylon. MICA is Rafale’s main AtA weapon. It is a dual-role BVR and WVR missile with maximum range of 80 kilometers, and can be rail-launched or ejected. It has maximum speed of Mach 3, maximum g capability of 50 g (these are, like with all missiles, achieved only some time after the launch, right before missile runs out of fuel), and can engage maneuvering target at maximum distance of 60 kilometers. Wing pylons allow for MICA to be released at loads up to 9 g, while airframe points are limited to up to 4 g. It is offered with either dual active radar or imaging infrared seeker, and has both LOBL (Lock On Before Launch) and LOAL (Lock On After Launch) capability. It is equipped with thrust vectoring and capable of HOB (High Off Boresight) engagement even of targets that are directly behind the Rafale. 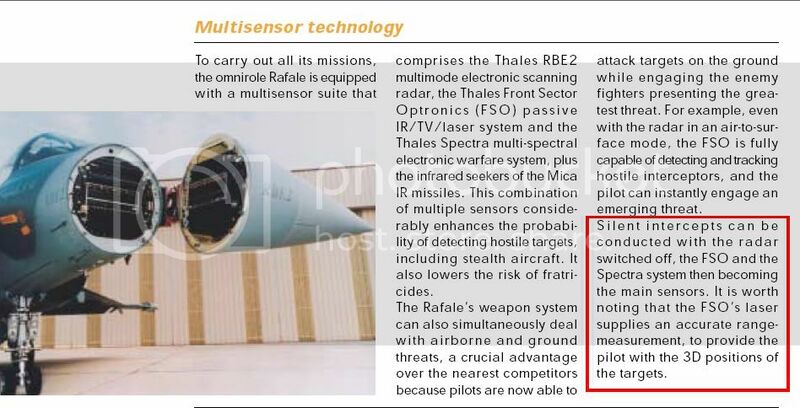 MICA IR seeker can also be utilized as an IRST for discrete optronics monitoring prior to the launch; this capability is not very important to Rafale due to its OSF IRST. Warhead is triggered by a Doppler radar proximity fuze. When used in combination with OSF and SPECTRA, MICA IR allows for completely passive engagement of targets even at beyond visual range. MICA was developed from 1982 onward by Matra; first trials occured in 1991 and missile was commissioned in 1996. Magic 2 is an old dogfighting missile, designed in 1968 by French company Matra (which is also producing MICA). It has 8 fixed and 4 movable fins, as well as a soldi fuel engine. Unlike preceding Magic 1, it is an all-aspect missile, and has rage of 8 km (compared to 5 km for Magic 1). Allegedly, seeker can function as “poor man’s IRST” out to range of 15 km. It also has better resistance to countermeasures. MBDA Meteor is a long-range BVR ramjet missile, intended for delivery before end of 2013. Different sources give range as being anywhere from 100 to 250 kilometers, but actual range is classified. It is said however that ducted rocket in Meteor has three times the range of the solid rocket; assuming that comparision is made to the missile it is replacing, Meteor’s range may be around 225 kilometers. Amount of thrust can be controlled by varying throat area of the gas generator nozzle, and thus burn rate. However, usage of active radar seeker means that it is more susceptible to countermeasures when compared to MICA IR, and defensive maneuvering by target might break radar lock. Rafale can carry a total of 9.500 kg of air-to-ground weapons. These include dumb bombs and unguided rockets, but also a variety of guided missiles and “smart” bombs. It can also carry Thales Damocles targeting pod and Reco NG digital reconnaissance pod. MBDA Apache is French GPS-guided anti-runway cruise missile. It uses submunition warheads, and has range of 140 km with maximum speed of 950 kph. Warhead contains 10 KRISS 50-kg anti-runway submunitions. Submunitions are designed to penetrate concrete, and their detonation can be programmed to prevent repairs being carried out. Missile has stealth characteristics (in both radar and IR spectrum) and can follow a pre-programmed flight path at very low altitude. SCALP EG/Storm Shadow is a newer missile based on Apache. It has range in excess of 250 km (potentially up to 400 km) with maximum speed of Mach 0,8, and uses a 400 kg BROACH warhead designed to take out hardened targets; BROACH is a tandem warhead, with first charge perforating target structure and removing soil above it (if there is any), with follow-up penetrator warhead penetrates inside the target and detonates after a pre-selected delay. Missile flies at low altitude, but can be launched from low or medium altitude. Terminal guidance uses passive imaging infrared sensor with autonomous target recognition system; at terminal stage, missile climbs to medium altitude and ejects ballistic cap, allowing IR seeker to see the target and select precise strike point based on comparision with files stored in missile’s memory. Missile also has “abort” mechanism: if target identification and acquisition process is unsuccessful, missile will fly to a predetermined crash site. AASM is a guidance kit for dumb bombs which can use INS, GPS, imaging infrared or semi-active laser guidance. Bomb weights are 125, 250 or 1.000 kg. Unlike US JDAM kit, AASM includes rocket booster and enlarged fins which extend range up to 60 km at high altitude or 15 km at low altitude. 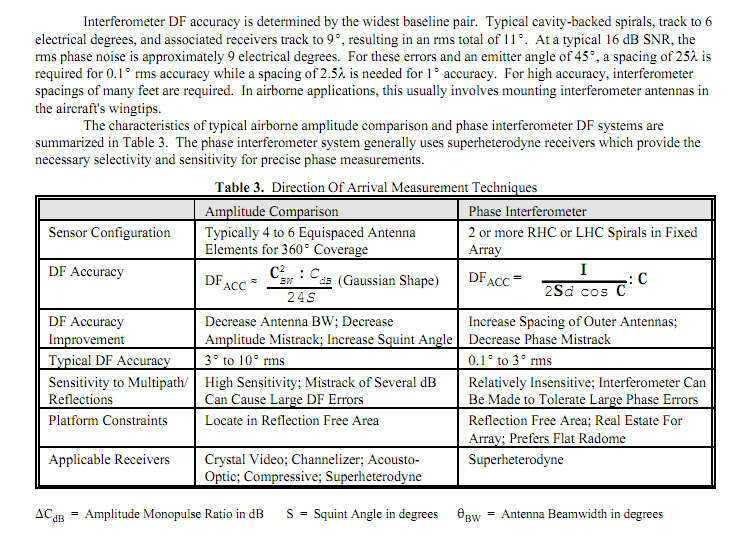 GPS/INS guidance has 10 meter CEP, while IIR/laser guidance allows for CEP of 1 meter. Unlike former, IIR and laser guidance kits allow for attacks on moving targets. When using INS or GPS guidance, coordinates are manually entered into system by the pilot. Paveway II is a set of laser guidance kits for 250, 500 and 1.000 kg bombs. Its reliance on laser guidance means that it can attack moving target but also that adverse weather conditions can cause it to loose a lock and miss the target. It consists of stability/lifting wings at the rear end of the bomb and guidance section at front of the bomb. AS-30L is a short-range laser-guided air-to-ground missile (mid-course guidance is inertial with laser being used in end stage). It has range of 3-11 kilometers, and has two-stage solid fuel rocket motor – a short burn time booster and longer burn time sustainer. It weights 520 kg, with warhead weight of 240 kg, and has maximum speed of Mach 1,5. AM39 Exocet is an air-launched anti-ship missile, with range of 50 to 70 kilometers (depending on launch platform’s speed and altitude). After the launch, it guides inertially towards the target, only turning on the radar late in flight in order to find the target. During ingress, it stays 1-2 meters above the sea surface, which means that it can only be detected when 6.000 meters away (unless detected by aircraft). Maximum speed is 315 meters per second (Mach 0,95), which means that target has only 20 seconds to react. ASMP is air-to-surface missile with 150/300 kt nuclear warhead. It has 300 km range at high altitude or 80 km at low altitude, and maximum speed at high altitude of Mach 3. Range against naval targets is 60 km. ASMP-A is improved version of missile, with 500 km range (likely 130 km at low altitude) and 300 kt nuclear warhead. SPECTRA is an all-including defense system. It includes radar, laser and missile warning sensors, along with active jamming and four chaff-flare dispensers. It can automatically identify and categorize threats and take defensive actions. All elements are built into the airframe, with radar warner antennas being located alongside engine intakes and in a module on top of the tailfin, which also incorporates laser warning sensors. Jammer antennas are built into canard mounts, and laser warners are mounted on each side of the fuselage below the cockpit. SPECTRA can record data obtained during the mission to provide electronic intelligence, and several Rafales can use datalink to coordinate SPECTRA activities (this may be only a future upgrade, however). It also may have active cancellation capabilities, as it is mentioned that it has “stealthy jamming modes capable of reducing apparent RCS of aircraft”; while it is impossible to respond to incoming signal instantaneously, delay might be small enough to allow for major RCS reduction against at least simpler radars. SPECTRAs angular accuracy is good enough to allow engagement of targets well beyond visual range, and targeting of targets on the ground. 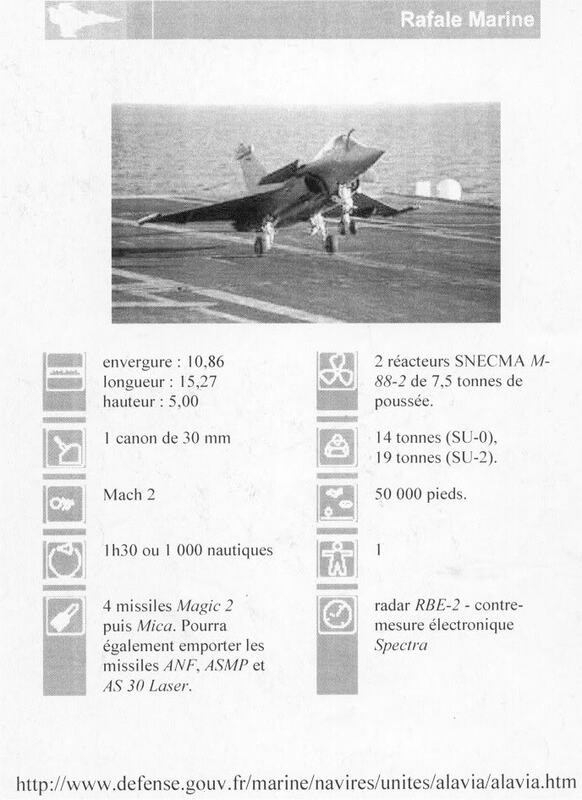 F1 Rafales, however, did not have full SPECTRA capability. DBEM can carry out ELINT/SIGINT functions, as it is integrated RWR and ECM. It is capable of detecting targets up to 250 km away, while localisation (including range estimation), identification and prioritization can be done for radar threats up to 200 km away. Due to its angular precision (<1*), it can also be used to guide radar and, presumably, IRST, as well as to attack targets. It has frequency coverage of 2 to 40 GHz (some sources suggest that lower end of frequency coverage is 100-200 MHz) and 360* angular coverage, and can be used to passively target and attack both ground and airborne emitters. During ground missions, it is capable of recognizing types of enemy air defenses and using that data in conjuction with terrain data to project “lethality zones”, allowing pilot to select safest ingression path. DECM is an AESA jammer, with 3 antennas located on fin root and canard roots. It has offensive, defensive and stealthy jamming modes. Each antenna can use thin beams to selectively jam radars of enemy fighters, possibly several at the time. It may also be useful against missiles with active radar seekers. DDM is an IR-based missile warner, with 360 degree azimuth coverage. It consists of two wide-angle imaging IR sensors on the fin tip pod sides, and has very low false alarm rate. DDM NG (delivered on serie Rafales in 2012) also provides angular resolution that allows for cueing of weapons, including DIRCM. Unlike radar-based missile warners such as on Eurofighter Typhoon, which emit detectable signals all the time, DDM is completely passive and as such does not give away Rafale’s position. DAL is a laser warning system. It consists of 3 sensors, two on front fuselage sides in front of canards and one on rear of SPECTRA fin tip pod. 4 upward-firing flare dispensers are fitted in the fuselage in wing roots, just forward of engine exhaust, while 2 chaff dispensers are located on the rear fuselage sides behind the wings. While flares are not effective against missiles with IIR seekers, chaff can be effective against active radar homing missiles. Rafale’s rear centerline pylon and two inner wing pylons on each wing are “wet” and can carry total of 5 1.150 liter conformal fuel tanks or 1.250 liter supersonic fuel tanks. Alternatively, three 2.000 liter external fuel tanks can be carried on centerline and inner wet pylons on each wing. At least 1.250 l and 2.000 l tanks are cleared for speeds up to Mach 1,6. Wikipedia puts flyaway cost at 90 million USD (when adjusted for inflation), which means that actual unit flyaway cost (without VAT) is 75,3 million USD. This article by Defense Aerospace, dating from 2006, puts Rafale C unit procurement (flyaway) cost at 62,1 million USD, including VAT; without VAT, it would come down to ~52 million USD. When adjusted for inflation, 2013 price would be 72,45 million USD, or 60,6 million USD without VAT. Considering that aircraft get upgraded with new systems, Wikipedia figure is more likely. If one includes VAT and additional systems (weapons etc.) that are usually sold abroad, cost rises dramatically: India’s first 126 Rafales have price tag of 20 billion USD, translating into 160 million USD per aircraft. In air-to-air battle, Rafale is most likely to stay completely passive. As all possible threat aircraft either have no passive sensors capable of independent acquisition and identification of targets or have sensors inferior to Rafale’s, this places it in advantageous position. Regardless of wether enemy has stealth fighters or not, Rafale can loiter at Mach 1,4 with 6 AAMs (or Mach 1,3 if centerline tank is included) and wait for the enemy to be detected by SPECTRA, OSF or DDM, in worse case extrapolating from missile launch direction when enemy tries to attack (also through use of DDM), and using that data to attack the enemy. This will effectively make any LO designs in use by the enemy (e.g. J-20) superfluous, as Rafale does not need radar to fire missiles well beyond visual range – or for anything else other than gun firing solution. Variety of missiles Rafale can carry will allow it to fire several missiles with different seekers at each target; BVR salvo might consist of MICA EM, MICA IR and Meteor. This might increase otherwise-abysymal BVR missiles’ effectiveness against fighter aircraft. In visual-range combat Rafale’s high agility and low energy loss rate make it very challenging opponent. Its high-calibre gun, only matched by Russian fighters, means that it can quickly cause catastrophic damage to the target. While Rafale C is a comparatively expensive fighter at around 75 million USD unit flyaway, it is not much more expensive than F-16C and is cheaper than Typhoon, F-15C or any stealth aircraft; only Western fighter aircraft that is significantly cheaper than Rafale is Gripen C. And while cost of single fighter is important, what matters is number of aircraft in the air; this is calculated by taking number of fighters that can be bought for 1 billion USD and multiplying it by number of sorties that can be flown by a single aircraft in certain amount of time, usually one day. Unlike Gripen, there is no info which suggests that possibility of road basing was taken into consideration during design process. If correct, this would make Rafale vulnerable to the enemy attack while on the ground – several hits by cruise missiles or cluster bombs / dispensers can make entire air base unusable for prolonged periods of time even if aircraft in it are not destroyed. Typhoon has larger radar, but that doesn’t matter because noone sane is going to use radar in air-to-air combat anyway (then again, sanity of Western military policymakers is questionable). What does matter is airframe agility, weapons systems, as well as IR and visual signatures. As far as agility goes, Rafale takes the cake since it has better aerodynamic configuration and greater g tolerance. However, while very good, Rafale’s MICA missiles are not as capable when shooting down fighters as Typhoon’s IRIS-T, nor are they as good anti-AWACS weapon as longer-ranged Meteor. On the other hand, GIAT-30 is superior to BK-27 in several ways, such as per-projectile destructiveness and rate of fire, and SPECTRA is superior to DASS. Rafale is limited to 55.000 ft altitude due to safety, while Typhoon can achieve 65.000 ft. While Rafale can supercruise in dry power at Mach 1,4 with 6 air-to-air missiles, or Mach 1,3 with 6 air-to-air missiles and a supersonic fuel tank, Typhoon’s supercruise speeds in same configurations are Mach 1,5 and 1,4, respectively. Strategically, Rafale is cheaper and consumes less fuel; it may also be easier to maintain, as evidenced by target maintenance of 8 MMHPFH, compared to Typhoon’s 9; wether these targets have been achieved is not known to me at this point. Gripen has aerodynamic configuration comparable to Rafale, though not as refined. Gripen is smaller and lighter, but has higher wing loading and very low thrust-to-weight ratio. This means that Rafale may be able to match its instanteneous turn rate, and does surpass Gripen’s sustained turn rate. Gripen C also has worse EW suite and no IRST. While NG version will solve most problems, it will also increase wing loading and overall complexity. Gripen is most likely easier to maintain than Rafale, though difference might not be very large as both have design features meant to make maintenance easier; it does use much less fuel, which is definetly a factor in lower operatin costs. Another, and very large, Rafale’s disadvantage is its lack of road-basing ability, something it shares with all other fighter aircraft mentioned in comparision section except for Gripen. However, Gripen is around 50-75% less expensive than Rafale, though Gripen E will be more expensive than C; this translates into greater force presence. F-18 is US multirole carrier-based fighter aircraft. It is inferior to Rafale in almost every way: it has less refined aerodynamics, lower operational g limit, lower design g limit, higher wing loading, lower thrust-to-weight ratio, lower climb rate and has no IRST. It is also slightly less expensive than Rafale, but larger maintenance downtime means that Rafale has advantage in providing force presence for cost. F-18E Super Hornet costs almost as much as Rafale, but has lower range, lower g limits (7,5 g compared to Rafale’s 11), worse aerodynamics (inherited from F-18A), higher wing loading (402 kg/m2 at 50% fuel and 6 AtA missiles compared to Rafale’s 276 kg/m2), lower thrust-to-weight ratio (1,07 at 6 missiles and 50% fuel compared to Rafale’s 1,22), lower climb rate, lower service ceilling and lower speed (Mach 1,8 dash, compared to Rafale’s Mach 2). In fact, both F-5 and F-16 are superior dogfighters. Its combat radius of 722 km is less than half of Rafale C’s. Su-35 is a Russian fighter, an answer to US F-15. It is very large and heavy twin-engined aircraft. While it has better aerodynamics than F-15 or F-16, it is still inferior to the Rafale. This, coupled with high wing loading (408 kg/m2, over 100 kg/m2 higher than Rafale’s), large size and high weight results in inferior maneuverability in air combat as well as inferior climb rate. While it may be equipped with thrust vectoring, it will not make it more maneuverable than Rafale, while increasing fuel consumption, weight and likelyhood of fatal mechanical failure. It has slightly higher service ceilling, and maximum speed of Mach 2,25 which also isn’t much more than Rafale’s Mach 2. While it has larger radar, this is not significant because using its radar will only make it a target for SPECTRA. Meanwhile, its IRST is decisively inferior to Rafale’s OSF, with 62,5% of OSFs range. It has identical armament loadout to Rafale C, being able to carry 30 mm gun and 14 hardpoints, but its gun and missiles are inferior to what Rafale can carry. F-22, like all stealth aircraft, is evolutionary design, a result of a flawed idea that enemy capabilities should be matched symetrically; only difference compared to F-15 is that it does not attempt to outrange enemy radar by increasing its own radar, but rather by reducing RCS. Yet it is fundamentally flawed. Its complete lack of optical sensors means that it has very limited IFF capabilities since pilots usually only turn IFF transponders on once they have left the battle area and are well inside friendly airspace. This means that F-22 will only be able to fire at BVR with help from extremely vulnerable assets such as AWACS and F-35s, if at all. If uplink proves not to be unjammable, F-22s will find themselves relegated to visual-range dogfighters unless refitted with imaging IRST or video camera. Even if it does prove able to fire from BVR, at such ranges missile’s kill probability will be low, and it will still be giving itself away. Aerodynamically, Rafale’s close-coupled canards provide it with all advantages of thrust vectoring and no disadvantages. In protracted close-range fight, F-22s usage of thrust vectoring will result in a huge fuel consumption, which – along with F-22s brick-like shape and low fuel fraction – will allow Rafale to run it out of the fuel, assuming that F-22 does not get killed due to the lack of energy. Rafale also has better instantaneous turn rate due to better aerodynamics and lower wing loading, as well as better roll rate due to lower wingspan and better roll control – F-22s thrust vectoring provides it with nose pointability without increasing g load, but it still needs lift to turn, and Rafale is also excellent at pointing the nose due to its close-coupled canards. 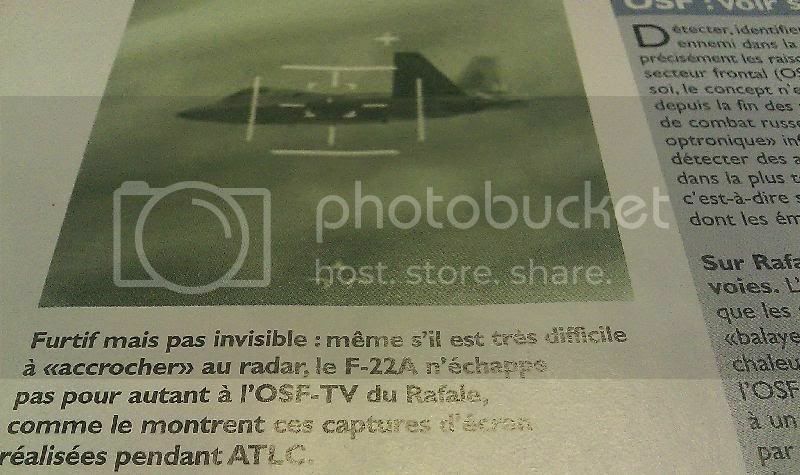 F-22 also has inferior rearward visibility, which means that during dogfight Rafale is less likely to get jumped unaware, even when DDM is ignored. In my estimate, Rafale’s OSF should be able to detect it from ~80-120 km from the front, and ~90-180 km from the rear. It is worth noting that at 11.000 meters, outside atmosphere temperature is -56,5 °C, whereas temperature due to the air friction is 54,4 °C at Mach 1,6 and 116,8 °C at Mach 2; in short, difference between aircraft and the embiant air is over 100 °C. This also applies to all other “VLO” fighters at these speeds. One (and only) mission where F-22 is superior to Rafale is SEAD; all-aspect stealth and higher cruise speed allow it to more easily destroy enemy radar stations, at least as long as these do not operate in VHF or HF bands. Contrary to what many think, F-35s internal weapons carriage does not provide any advantage in retaining energy during dogfight; first because it does not have very good aerodynamic shape compared to Rafale and because internal stores add weight and drag; second because Rafale is, like Typhoon, designed for combat performance at 50% fuel and 6 AAMs. 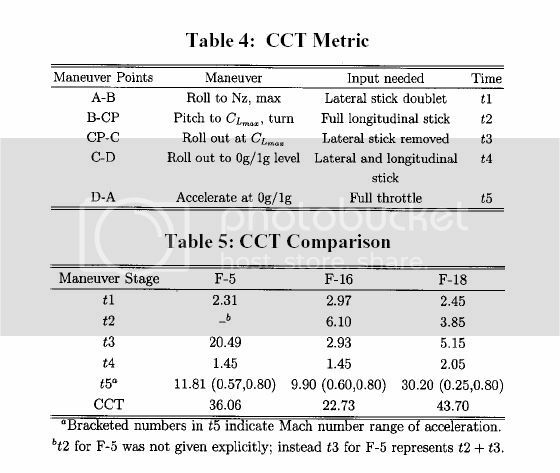 To obtain high agility, aircraft needs large amount of excess lift, which is achieved by having low wing loading and high lift coefficient (Cl); excess thrust, which is measured by thrust-to-weight ratio; low drag, which is achieved by having relatively slim body, avoiding wing stall and minimizing angle of attack for any particular turn rate; high maximum structural load, allowing aircraft to pull high g maneuvers repeatedly. F-35A (baseline and most numerous F-35 variant) is inferior to Rafale in all aspects: it has very high wing loading, and traditional aerodynamic configuration results in greater loss of lift with increasing angle of attack; thrust-to-weight ratio is comparably low; aerodynamic configuration is optimized for strike, and very fat body (result of both STOVL and VLO requirements) results in a very high drag; lack of close-coupled canards means that F-35 has to achieve higher angle of attack for same lift coefficient, and finally greater weight results in greater inertia. Maximum speed of Mach 1,6 means that it cannot outrun Rafale or any other modern fighter aircraft. F-35’s reliance on beyond visual range combat forces it to carry large number of missiles, but even when using external pylons, F-35 can carry no more than 8 missiles. Due to removal of fire protection measures and fuel carriage around the engine, single round from Rafale’s 30 mm cannon can bring it down. As for F-35s “stealth”, Rafale’s OSF can likely detect it at ~100 km from front, and ~200-220 km from the rear if F-35 is subsonic. F-135 is world’s hottest running engine, and has no IR signature reduction measures, which were deleted to save weight; F-35s inability to supercruise makes this even worse since F-35 will have to use afterburner to fly supersonically, producing very visible afterburner plume. EOTS is also optimized for air-to-ground detection, leaving it underperforming when compared to dedicated air-to-air IRST – compared to Rafale’s IRST-centric approach to air combat, this is a very serious shortcoming (or would be if two fighters were to ever come to blows, which is unlikely). Internal weapons carriage does not add to stealth, but only likelyhood of failure (in addition to performance penalties mentioned above). Both aircraft have 360 degree coverage with IR sensors, though F-35 uses six narrower-angle cameras as opposed to Rafale’s two fish-eye cameras. Its uneven belly makes it rather unstealthy to even X-band radars from below, and it is not stealthy from behind (in fact, Gripen may well have lower RCS from the rear). 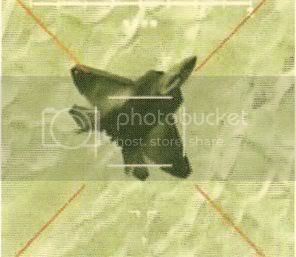 J-20 is enlarged F-35. But even ignoring size and weight difference, it is different enough from F-35 to warrant a separate section. While it has similar aerodynamic configuration to the F-35, it is far larger and has large canards right behind air intakes; wings are also more swept, indicating higher operational Mach than the F-35. These features may also make it more maneuverable than the F-35, but its wing loading is likely to be too high to allow it to match Western air superiority fighters – in fact, canards are likely addition made during design process to try and salvage some performance. Its mammoth size – its length is estimated to be around 22 meters – also points to this conclusion, as does the fact that its landing gear is located well forward, indicating a very stable aircraft (and thus less maneuverable than same design but unstable). Stealth requirements mean that canards are coplanar to wing, which in combination with their distance from wing leading edge makes them ineffective as lift-enhancing surface. Chinese industry is still reliant on Russia for high-performance fighter engines, and AL-31F (most powerful Russian engine China has access to) is inadequate for J-20s heavy weight; resultant low thrust-to-weight ratio is another area where it is similar to the F-35. Its radar stealth is focused on frontal aspect; side and rear aspect stealth is – like the F-35 but unlike the F-22 – far inferior to the frontal aspect stealth. It does not seem to have any IR signature reduction measures to speak of, which means that it is not stealthy at all when it comes to combat against modern fighter aircraft, IRST-less F-22 and Gripen C excepted – in this way it is also very similar to the F-35. It is certain to have higher IR signature than the F-22. Unlike F-22, its center bays can accept 4 missiles, for a possible total of 6 internally-carried missiles. J-31 is a blend of F-22 and F-35 characteristics. Overall aerodynamic configuration goes more towards F-35, though vertical tails, nose and cockpit are basically taken from F-22 (including lack of rearward visibility). Intakes and wings are copied from the F-35, which may suggest poorer maneuverability and supersonic performance when compared to the F-22 – or Rafale. Despite some statements, Dassault Rafale is, and always was, primarly an air superiority aircraft. It has aerodynamics whose refinement goes beyond what is seen on other fighter aircraft around the world, even Saab Gripen, and is equipped with wide range of weapons which allow it to carry out different missions. Still, it would profit from being able to launch IRIS-T. Thrust vectoring could be put on Rafale, but its effectiveness would be low to none. Rafale is already capable of most things that TVC equipped aircraft can do; only possible benefit of thrust vectoring is longer range due to less drag in level flight. What it would certainly increase, however, is expense, weight, complexity, fuel consumption, maintenance downtime, unreliability and possibility of crash. DIRCM can be placed on Rafale as a future upgrade, and DDM NG offers good enough resolution for DIRCM to be useful against missiles. The word canard is coming from the French canard which means DUCK. Ducks have a layer of feather just around the neck which has an effect on their aerodynamics; on aircraft it is a control surface positioned in front of the main wing instead of behind.